In Part 3 of my blog series The Making of the Wall-Saver safety cylinder, I discussed the quasi-success of the first mold I created, and the trouble of getting the hard plastic chamber inserts stuck inside prototypes. I decided that I wanted the chambers to be formed as part of the silicone mold rather than separate, and also that I wanted them to be at the top of the mold where they would be easier to coat with mold release. I was concerned about extraction but given that the original idea had extraction problems of its own, it was worth a try. 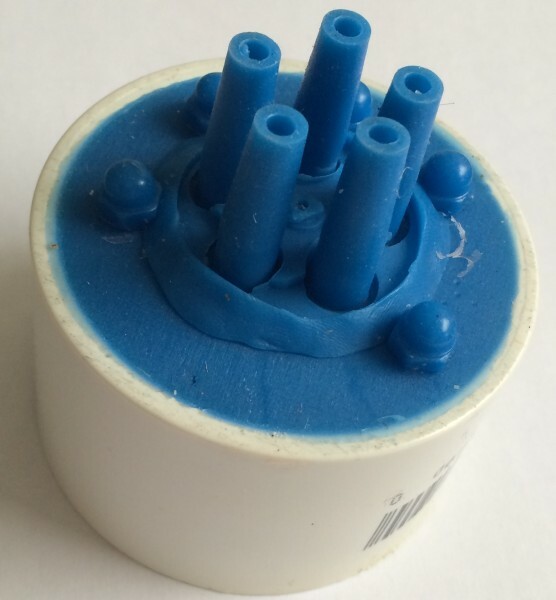 The first silicone chambers, from the top of the mold. A pair of failed castings from the upside-down mold. Bubbles are everywhere. So I poured another mold, this time with the cylinder upside down. Much to my surprise, the silicone cores extracted quite well. So here’s a mold that works! Sort of. with the front of the chamber oriented upwards as the plastic is poured in, and especially with the slightly conical shape I had given it, virtually all air escapes through tiny vents (.025”) placed at the highest point. But with the back of the cylinder upward, the cast-in shape of the case heads and extractor cutout had numerous little places where air could get trapped, and lacked a clear “high point” where vents could be used. The result was frequent bubbles in the relatively delicate features—and in different spots each time, so it wasn’t as simple as just adding a vent (which, incidentally, is not simple at all). I don’t think a single “clean” casting came out of that mold. The original HDPE masters and polyurethane castings meant to hold the brass down against spring pressure. 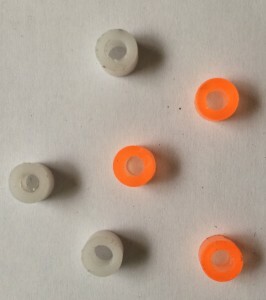 The mold that made the first plastic inserts. The first fully-functional prototype–the brass had popped out after just a few firing-pin strikes. So silicone chambers worked, but not back-end-up. Thankfully, I did get a good enough casting out of that mold to try the insertion of springs, brass plungers, and plastic inserts to whole those to in place. I made little HDPE rings and poured silicone around them to make a mold. This worked just fine for producing polyurethane doughnuts of exactly the right size and shape, as long as you remembered that the small volume meant a longer curing time—and demolding before curing meant oval inserts that didn’t work at all! The first draft of spring insertion was a failure. The plastic inserts slipped in, and then back out again. I tried various glues but none of them worked. I concluded that I needed to add a ridge to the insert (and a hollow in the chamber) to produce something reliable. However, since I was working with HDPE rod the same size as the chambers (and had no lathe), I didn’t have a convenient way to actually cut the ridge into it. I decided to cut a ridge into the chambers themselves, then take a casting of that ridge and use the casting to make a mold that would produce ridged inserts. Sounds easy! And it sort of worked.